Tooth development depends on an epithelial–mesenchymal interaction driven by many signaling pathways. As tooth development progresses, bone tissue is formed around the tooth germ, creating the bony crypts in the developing maxilla and mandible. By the end of the tooth crown development and the beginning of root formation, the tooth initiates an active movement toward the oral cavity. Tooth eruption is the process by which the tooth emerges into the oral cavity, moving through the barrier of surrounding alveolar bone tissue and soft tissues. Great efforts have been dedicated to elucidate the etiology of tooth eruption; however, it is well accepted that the dental follicle plays a major role in regulating the required osteoclastogenesis to establish the eruption pathway., Dental follicle cells release the macrophage colony-stimulating factor 1 (M-CSF-1) and monocyte chemotactic protein 1 (MCP-1), which attracts osteoclast precursors to the dental follicle. M-CSF-1 induces the fusion of osteoclast precursors and osteoclast differentiation,, mainly through the receptor activator of nuclear factor kappa (RANK). CSF-1 induces the expression of RANK on osteoclast precursor cells, and once RANK binds its ligand, the RANK β (RANKL), osteoclast precursors fuse and differentiate into osteoclasts under low levels of osteoprotegerin., Two bursts of osteoclastogenesis have been reported during the eruptive process of rat molars, a major one in 3-day-old animals, and a second one, of less magnitude, in 9 to 11-day-old animals. Mast cells are known for their role in immune responses and in the pathogenesis of several chronic allergic/inflammatory conditions, autoimmune diseases, ECM degradation, angiogenesis, and recruitment of inflammatory cells. Their presence at the lamina propria during the eruptive process suggests a possible role of these cells in the necessary remodeling of the connective tissue. Therefore, ECM remodeling is a requirement for tooth eruption; there is not enough information about the key elements involved in this process. The analysis of MMP-9 expression in the bone and lamina propria cells and its correlation with the prevalence of these cells throughout dental eruption can improve the current understanding of the tissue remodeling processes involved in tooth eruption. This work was performed according to the Ethical Principles of Animal Experimentation adopted by the Ethics Committee on Animal Use, being approved on 12/04/2015 under license number 85/2015. Twenty-eight 4, 6, 9, 11, 14, 16, and 17-day-old Wistar rats (Rattus norvegicus) were used in this study. The animals were provided by the Health Sciences Center facility and maintained at constant room temperature (22–24°C) under a 12:12 light/dark cycle, with free access to water and food (Labina, Purina, Brazil). The use of rat molars as a model for tooth eruption studies is valuable as they are teeth of limited eruption, analogous to human dentition. As the aim of this article is to analyze several aspects regarding the eruption of the first molar, rats up to 17 days were selected, corresponding to the reported age of first molar eruption [Table 1]. The animals were anesthetized by intraperitoneal injection with ketamine (30 mg/kg) and xylazine (3 mg/kg), and euthanized by decapitation. The maxillae were removed, dissected, and the fragments containing the first molars were fixed at room temperature for 48 h in 4% formaldehyde solution buffered with 0.1-M sodium phosphate of pH 7.2. Next, the jaws were decalcified in 7% Ethylenediaminetetraacetic acid (EDTA) solution containing 0.5% formaldehyde buffered with 0.1-M sodium phosphate of pH 7.2 for 40 days, and after this period, the specimens were processed to be embedded in paraffin. The paraffin blocks were submitted to microtomy to obtain nonserial sections with 5-µm thickness for routine staining (Mallory’s trichrome and Alcian Blue; Sigma-Aldrich Chemical Company, St. Louis, Missouri, USA) and 3 μm for immunohistochemistry. The deparaffinized sections were stained with Alcian Blue for the mast cell detection, and the Mallory’s trichrome-stained slides were used to measure the bone area. The sections obtained by the microtomy were deparaffinized in an oven at 60°C for 40 min, followed by diaphanization and rehydration. The formic pigment was removed with ammonium hydroxide solution (10%) in ethanol (95%), and then the slides were subjected to antigen recovery using a citrate buffer solution (10-mM citric acid and 0.05% Tween 20 with pH 6), heated between 90 and 95°C for 30 min. Novocastra Peroxidase Block (Leica Biosystems, Buffalo Grove, Illinois, USA) was used to neutralize endogenous peroxidase. The polymer-detection system was NovoLink Novocastra (Leica Biosystems Newcastle Ltd, Newcastle Upon Tyne, UK). The primary antibody used was anti-MMP-9 (Santa Cruz Biotechnology, Dallas, Texas, USA), diluted at 1:500 and incubated for 60 min in a humidified chamber at room temperature. As a negative control, the incubation step with primary antibodies was performed using a nonimmune serum instead. 3.3-Diaminobenzidine tetrahydrochloride (Sigma-Aldrich Chemical Company) was used to develop the peroxidase activity, and the slides were counterstained with Mayer’s hematoxylin. The slides were examined under light microscope (Olympus AX70; Olympus America Inc., Melville, New York, USA) with Olympus UPlan FI 20×/0.50 objective lenses. The selected sections were analyzed and photographed with AxioCam ERc5s (Carl Zeiss Vision GmbH, Jena, Germany) and AxioVision Release 4.8.2 (Carl Zeiss Vision GmbH) and saved in TIF and ZIV formats. To establish the bone resorption at the coronal region of the alveolar crypt and the bone apposition at the basal region, bone area (in µm2) from these regions was measured. For the mast cell quantification, the entire surface of the lamina propria at the region of the upper first molar was scanned, and the Alcian Blue-stained mast cells were quantified. MMP-9 expression in the lamina propria, osteocytes, and mast cells was evaluated via qualitative descriptive analysis. Based on the intensity of the immunostaining in each of the structures evaluated, the expression of MMP-9 was considered negative, weak, moderate, or strong. To determine the number of osteoclasts expressing MMP-9 on the coronal bone region, the immunoslides were analyzed and the number of MMP-9-expressing cells was quantified and submitted to statistical analysis. For that purpose, four nonserial sections of each animal were used. The kappa index was used to evaluate the interobserver variability (0.87); [Table 2] summarizes the procedures performed at each age. All statistical analyses were performed using the GraphPad software (GraphPad Software, Inc., La Jolla, California, USA), and the results with P < 0.05 were considered significant. Data regarding the evaluation of bone area, quantification of mast cells, and quantification of osteoclasts expressing MMP-9 were submitted to the one-way analysis of variance (ANOVA) test. Throughout the eruption process, we observed the progressive development of the tooth germ, with increased deposition of enamel and dentin. As the development continued, perceptible bone remodeling was detected, with bone apposition at the base of the tooth, and continued resorption of the bone interposed between the tooth and oral mucosa. At 9 days, the tooth crown showed a thick layer of dentin and enamel [[Figure 1]A]. Bone tissue could be observed at the base of the bony crypt, and the coronal bone resorption was intensified, compared to the earlier stages. Many osteoclasts could be observed at the coronal bone surface, and the lamina propria was thinner when compared to the earlier stages [[Figure 1]B]. To evaluate the progression of bone deposition at the base of the alveolar bony crypt during the eruptive process, the bone area in this region was measured [[Figure 1]C]. Bone deposition was fairly stable from 6 to 11-day-old animals. In 14 to 17-day-old animals, an expressive increase in bone area was observed (P < 0.0001). To evaluate the bone resorption at the coronal region of the bony crypt, we measured the bone area throughout the eruptive process [[Figure 1]D]. Six-day-old animals had large amounts of bone tissue, but at 9 days, bone resorption was intensified, and a drop on the coronal bone area was detected. Between 11 and 14 days, a substantial reduction in bone area could be observed, and at 17 days, complete resorption of the coronal bone was detected (P < 0.0001), and the cusp tips of the first molars could be observed in the oral cavity. To determine the prevalence of the mast cells in the lamina propria throughout the eruptive process, the number of these cells was quantified using Alcian Blue-stained slides. Mast cells were detected in higher numbers at the lamina propria of 9-day-old animals. Before or after this age, few mast cells could be detected (P < 0.0001) [[Figure 2]A and B]. As bone remodeling and disruption of the lamina propria are essential steps for the progression of tooth eruption, we decided to investigate the expression of MMP-9 during this process. From 4 to 6-day-old animals, MMP-9 expression was detected in osteocytes at the coronal bone [[Figure 3]A and B]. In 9-day-old animals, strong MMP-9 expression was detected on the osteoclasts at the coronal bone [[Figure 3]E]. From 11 to 14 days, the coronal bone was progressively resorbed, but the remaining cells still expressed MMP-9. The number of osteoclasts over the surface of the coronal bone was quantified [[Figure 3]F]. In 4-day-old animals, a maximal number of osteoclasts was observed, followed by a decrease of these cells throughout the eruptive process (P < 0.0001). In the lamina propria of the 4-day-old animals [[Figure 3]A], weak MMP-9 expression was observed, only at isolated points, making this expression pattern similar to the one presented at 6 days. At 9 days, a great number of mast cells strongly expressing MMP-9 was observed [[Figure 3]C and D]. At 11 days, the MMP-9 expression was still evident at the connective tissue cells, especially between the cusp tips. At 14 and 16 days, a similar expression was detected. To establish the eruptive pathway, tooth eruption requires intense bone remodeling around the developing tooth and disruption of the connective tissue of lamina propria. Our results showed active bone resorption in the coronal region of the alveolar crypt, especially between 11 and 14 days, when drastic reduction in the bone area was observed. This reduction is to be expected, as the tooth is reaching the final stages of the intraosseous phase of tooth eruption. These results were similar to those found in other studies,,, and consistent, as bone resorption is due to the activity of osteoclasts; previous reports demonstrated an increased formation of these cells in 9 to 11-day-old rats. Regarding the bone apposition at the base of the alveolus, it has been shown that in rat molars, the growth of bone tissue at the base of the alveolar crypt begins around the third day of age and ends around the 18th day of life, when the tooth emerges in the oral cavity. Our histomorphometric analysis detected an increased bone deposition especially from days 14 to 17. Curiously, no real gain in bone area could be observed between the sixth and 11th days. This stabilization of the bone apposition was observed before and was correlated to the decreased expression of bone morphogenetic protein-2 gene in the dental follicle between days 5 and 7. 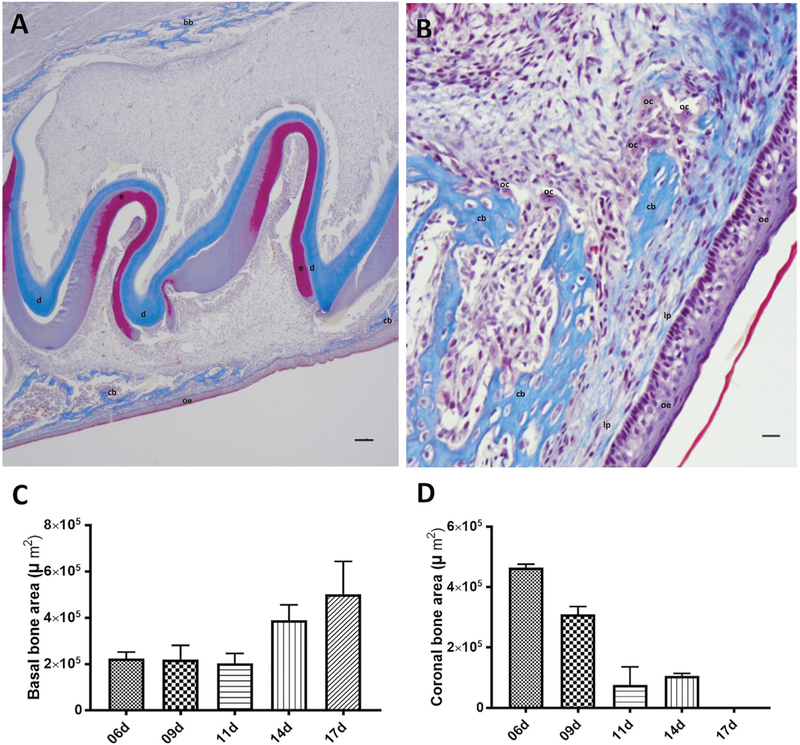 An active process of tooth eruption has been reported in 9 to 11-day-old rats, due to the intense bone resorption and degradation of the connective tissue of the lamina propria. We detected strong expression of MMP-9 in osteoclasts and osteocytes at the coronal bone of 9 and 11-day-old rats. Early studies demonstrated MMP-9 expression in osteoclasts during mouse development and in human osteoclasts, suggesting this enzyme is important for bone resorption, and essential for the early stages of osteoclastic activity. Expression of MMP-9 messenger RNA was also detected in osteoclasts during mouse tooth eruption, suggesting a role for MMP-9 in ECM remodeling. By quantifying the number of osteoclasts expressing MMP-9 on the coronal bone, a reduction on the number of these cells was observed throughout the eruption process. This result is consistent with previous findings that reported a high number of osteoclasts after the first burst of osteoclastogenesis, in 3-day-old rats, followed by a decline in the number of these cells as the bone is resorbed. In our study, we also observed MMP-9 expression on mast cells at the lamina propria during the eruption process, suggesting that these cells may collaborate in the remodeling of ECM components by promoting MMP-9 activity. It has been shown in vivo that mast cells are capable of processing pro-MMP-9, releasing the active form of this enzyme. This activity seems to be due to one of the mast cell proteases, chymase, because lack of this protease resulted in lack of tissue remodeling and increased levels of connective tissue proteins. A correlation between mast cells and MMP-9 was also demonstrated in squamous cell carcinoma lesions, where a high number of mast cells at the tumor stroma was correlated with strong MMP-9 expression in tumor cells. It was suggested that mast cells may activate MMP-9, leading to ECM degradation and tumor progression. An elevated number of mast cells expressing MMP-9 during molar eruption was also reported in earlier studies, suggesting a possible association with ECM degradation during mucosal penetration. Taken together, our results suggest that mast cells could be potentially involved in the recruitment of osteoclast precursors for the second burst of osteoclastogenesis on tooth eruption and possibly related to the activation of MMP-9. The strong expression of this enzyme in osteoclasts and mast cells suggests that MMP-9 is important in the removal of bone and lamina propria ECM during tooth eruption. These results propose a correlation between mast cells and MMP-9 during the events of tooth eruption, including a role in the formation of osteoclasts and the remodeling of bone and connective tissue. However, the precise nature of this relationship remains to be determined, and therefore, further studies need to be conducted addressing the progression of tooth eruption in the absence of MMP-9 and/or mast cell activity. To Espirito Santo Research Foundation (FAPES), for providing graduate scholarship to Lima (register number 69952345/2015). This work was performed according to the Ethical Principles of Animal Experimentation adopted by the Ethics Committee on Animal Use of the Federal University of Espirito Santo, Brazil (CEUA-UFES), being approved on 12/04/2015 under license number 85/2015. Thesleff I. Current understanding of the process of tooth formation: Transfer from the laboratory to the clinic. Aust Dent J 2014;59:48-54. Nanci A. Ten Cate’s oral histology: Development, structure, and function. St.Loius:Mosby; 2013. Marks SC Jr, Schroeder HE. Tooth eruption: Theories and facts. Anat Rec 1996;245:374-93. Wise GE. Cellular and molecular basis of tooth eruption. Orthod Craniofac Res 2009;12:67-73. Wise GE, He H, Gutierrez DL, Ring S, Yao S. Requirement of alveolar bone formation for eruption of rat molars. Eur J Oral Sci 2011;119:333-8. Wise GE, Zhao L, Lin F. Effects of epidermal growth factor (EGF) and colony-stimulating factor-1 (CSF-1) on expression of c-fos in rat mandibular molars: Implications for tooth eruption. Cell Tissue Res 1996;284:1-7. Wise GE, Huang H, Que BG. Gene expression of potential tooth eruption molecules in the dental follicle of the mouse. Eur J Oral Sci 1999;107:482-6. Yasuda H, Shima N, Nakagawa N, Yamaguchi K, Kinosaki M, Goto M et al. A novel molecular mechanism modulating osteoclast differentiation and function. Bone 1999;25:109-13. Wise GE, Yao S, Henk WG. Bone formation as a potential motive force of tooth eruption in the rat molar. Clin Anat 2007;20:632-9. Wise GE, King GJ. Mechanisms of tooth eruption and orthodontic tooth movement. J Dent Res 2008;87:414-34. Chakrabarti S, Patel K. Matrix metalloproteinase-2 (MMP-2) and MMP-9 in pulmonary pathology. Exp Lung Res 2005;31:599-621. Ning C, Min H, Raouf AK. Matrix metalloproteinases and tissue inhibitors of metalloproteinases: Structure, function, and biochemistry. Circ Res 2003;92:827-39. Klein T, Bischoff R. Physiology and pathophysiology of matrix metalloproteases. Amino Acids 2011;41:271-90. Cerri PS, Pereira-Júnior JA, Biselli NB, Sasso-Cerri E. Mast cells and MMP-9 in the lamina propria during eruption of rat molars: Quantitative and immunohistochemical evaluation. J Anat 2010;217:116-25. Da Silva EZ, Jamur MC, Oliver C. Mast cell function: A new vision of an old cell. J Histochem Cytochem 2014;62:698-738. Gudiseva S, Santosh ABR, Chitturi R, Anumula V, Poosarla C, Baddam VRR. The role of mast cells in oral squamous cell carcinoma. Contemp Oncol (Pozn) 2017;21:21-9. Denes BJ, Lagou A, Dorotheou D, Kiliaridis S. A longitudinal study on timing and velocity of rat molar eruption: Timing of rat molar eruption. Lab Anim 2018;52:394-401. Symons AL. Reduced growth hormone receptor immunoreactivity in osteoclasts adjacent to the erupting molar in the incisor-absent (osteopetrotic) rat. Eur J Oral Sci 2003;11:503-9. Bradaschia-Correa V, Massa L, Arana-Chaves VE. Effects of alendronate on tooth eruption and molar root formation in young growing rats. Cell Tissue Res 2007;330:475-85. Liu D, Yao S, Pan F, Wise GE. Chronology and regulation of gene expression of RANKL in the rat dental follicle. Eur J Oral Sci 2005;113:404-9. Ikawa Y, Yonekawa T, Ohkuni Y, Kuribayashi M, Fukino K, Ueno K. A comparative study of histamine activities on differentiation of osteoblasts and osteoclasts. J Toxicol Sci 2007;32:555-64. Yamaura K, Yonekawa T, Nakamura T, Yano S, Ueno K. The histamine H2-receptor antagonist, cimetidine, inhibits the articular osteopenia in rats with adjuvant-induced arthritis by suppressing the osteoclast differentiation induced by histamine. J Pharmacol Sci 2003;92:43-9. Fouilloux I, Duplan MB, Baroukh B, Cherruau M, Saffar JL, Lesclous P. Mast cell activation and degranulation occur early during induction of periosteal bone resorption. Bone 2006;38:59-66. Reponen P, Sahlberg C, Munaut C, Thesleff I, Tryggvason K. High expression of 92-kD type IV collagenase (gelatinase B) in the osteoclast lineage during mouse development. J Cell Biol 1994;124:1091-102. Wucherpfennig AL, Li YP, Stetler-Stevenson WG, Rosenberg AE, Stashenko P. Expression of 92 kD type IV collagenase/gelatinase B in human osteoclasts. J Bone Miner Res 1994;9:549-56. Delaisse JM, Engsig MT, Everts V, del Carmen Ovejero M, Ferreras M, Lund L et al. Proteinases in bone resorption: Obvious and less obvious roles. Clin Chim Acta 2000;291:223-34. Sahlberg C, Reponen P, Tryggvason K, Thesleff I. Timp-1, −2 and −3 show coexpression with gelatinases A and B during mouse tooth morphogenesis. Eur J Oral Sci 1999;107:121-30. Wise GE, Frazier-Bowers S, D’Souza RN. Cellular, molecular, and genetic determinants of tooth eruption. Crit Rev Oral Biol Med 2002;13:323-33. Tchougounova E, Lundequist A, Fajardo I, Winberg O, Abrink M, Pejler G. A key role for mast cell chymase in the activation of pro-matrix metalloprotease-9 and pro-matrix metalloprotease-2. J Biol Chem 2005;280:9291-6. Souza FV, De Andrade SPP, De Almeida FR, Pereira PL, De Souza LB. Mast cells and matrix metalloproteinase 9 expression in actinic cheilitis and lip squamous cell carcinoma. Oral Surg Oral Med Oral Pathol Oral Radiol Endod 2011;112:342-8.